There are 8 types of doves and pigeons in Utah. Two very prolific ones are the Mourning Dove and the Eurasian Collared Dove. The second one has only been in Utah County for about 20 years, but is now just as common as it's native brother! 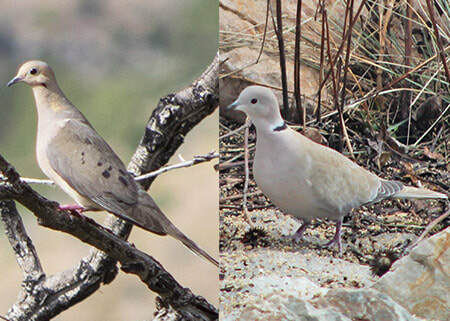 While some environmentalists fear that the Eurasian Collared Dove will eventually displace the native Mourning Dove, there is as yet no indication of that having taken place. There seems to be room for both of them! However, the hunting season for the Mourning Dove is limited to the months of September and October. Just to make sure the Eurasian Collared Dove doesn't take over the habitat, it is fair game for hunters all year round, even without a license! Pick a pigeon! Do you prefer the Mourning Dove (left) or the Eurasian Collared Dove (right)? The mourning dove is native to North America, and is identifiable by it's distinctive spotted wings, pinkish buff coloration and white tail tips. It is sometimes erroneously called a turtle dove. It gets its name from its low-toned moaning coo. It is monogamous and raises its young together as a pair, taking turns sitting on the eggs in the nest. Some mourning doves migrate and others stay in the same place year round. In warm climates a pair might have 6 broods in a year, each with a clutch of 2 eggs! The hatched young are called squabs. They live in open areas with a few trees, and have also adapted well to urban and suburban environments. The Eurasian Collared Dove sports a little bling around the back of his neck, in a stylish black collar (hence its name). He is grey-buff to pinkish-grey overall. The tail feathers are grey-buff above, and dark grey tipped white below. Originally from the Bay of Bengal in Asia, they have slowly moved northward, and then west. Escaping captivity in the Bahamas in the 1970's they were found in Florida a decade later. They arrived in Utah County in 1997, and have become well established across North America. It is not migratory, but can be found far north in Canada in the summer months, and as far south as Central America during the winter. It adapts well to suburban and open areas. It also has 4-6 broods per season. The male sits on the eggs from dawn to late afternoon and the female takes the evening and night shift. When the squabs hatch they are fed pigeon's milk, a secretion regurgitated from the crop of the parents into the young birds. They love seeds, both natural and in your back yard bird feeders!